AMREF is the African Medical and Research Foundation, a uniquely African organization, created in 1957 which runs 145 health programmes a year to help around 7 million people in Africa. Headquartered in Nairobi and with offices around the world, AMREF ensures access to health care for the most vulnerable and marginalized people in Africa, with a focus on women and children. AMREF works within the communities, and works with and for women as they are the heart of the communities. Indeed, by focusing on midwives training in the Stand Up For African Mothers campaign, AMREF is able to talk about the key role of women and mothers for a healthy Africa and the needs of health workers to reduce mortality rates for mothers but also for children. AMREF ou African Medical and Research Foundation, est la première ONG africaine créée en 1957 qui gère 100 programmes de santé chaque année pour venir en aide à presque 7 millions de personnes en Afrique. Basée à Nairobi et avec des bureaux ouverts dans le monde entier, AMREF assure l’accés aux soins médicaux pour les personnes les plus vulnérables et marginalisées d’Afrique, avec une attention plus particulière pour les femmes et les enfants. AMREF travaille au sein des communautés, avec et pour les femmes qui en sont le coeur. Ainsi, en se focalisant sur la formation des sages-femmes avec la campagne «Stand Up For African Mothers», AMREF est capable de parler du rôle-clef des femmes et des mères pour une Afrique en bonne santé mais aussi des besoins en personnel de santé pour réduire le taux de mortalité aussi bien chez les mères que chez leurs enfants. A 54 años de su creación, AMREF Flying Doctors, 1a ONG africana de salud pública, actúa en todos los ámbitos de la salud pública. La organización trabaja en particular a favor de la salud de las mujeres, de las madres y de sus niños, porque es inaceptable que mueran todavía cerca de 200.000 mujeres africanas cada año durante el embarazo o el parto, y que un millón y medio de niños queden huérfanos. Así, para reducir la mortalidad materna e infantil, AMREF defiende un proyecto ambicioso dentro del marco de los Objetivos del Milenio (OMD): el de capacitar a 15.000 parteras de aquí a 2015. En este artículo se habla del ejemplo de la formación de parteras en el Sudán Meridional, flamante estado africano. Se trata de una formación con presencia física, pero AMREF también capacita a distancia a miles de enfermeras y parteras a través de eLearning (por ejemplo, el programa de formación de 10.000 parteras en Uganda en 2010-2013). Why focus on maternal, neonatal and child health? Reducing maternal mortality by improving access to and use of reproductive health services. Fighting against the lack of health workers training community midwives. Encouraging pregnant women to take preventive measures against malaria. Preventing HIV and raising awareness about how to prevent mother-to-child transmission. Educating about hygiene and improving access to clean water and sanitation. Promoting reproductive rights, helping women to make informed choices about family planning. Raising awareness about violence against women and helping women to access the relevant services and work with authorities to better protect them. 2The Stand Up for African Mothers campaign is designed to spread one simple and clear message: healthy Africa means healthy mothers and healthy mothers need African midwives. The African midwives will reduce maternal mortality providing medical care to pregnant women and during childbirth but will also enhance prevention against malaria and HIV, and promote hygiene and reproductive rights. 3The organization is particularly concerned about healthcare for women, for mothers and their children, and believes that it is unacceptable that almost 200,000 African women still die every year during pregnancy and labor, and that 1.5 million children are orphaned. 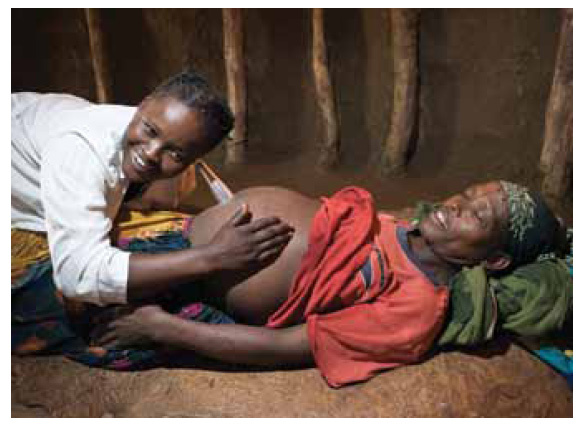 Thus in order to reduce mother and child mortality, AMREF supports an ambitious project under the UN's Millennium Development Goals (MDG): to train 15,000 midwives by 2015 (Figure 1). In this paper, we consider the example of training midwives in South Sudan, the new African state which is undergoing face-to-face training. We also consider eLearning midwives training programs with the example of AMREF in Uganda. 4What women in high-income countries take for granted – trained midwives, obstetricians and delivery rooms, antibiotics and drugs in the event of complications – all these apparently basic things are true privileges for African women. 5In Africa, 1 woman in 39 risks dying during pregnancy or delivery, against 1 in 4,300 in developing countries. This is the greatest inequality in the world. 6On the continent, 200,000 mothers die every year. The women and children most affected are those in the more remote and poorer regions. Every year 1.5 million children are orphaned, losing their mothers during delivery of a little brother or sister. These newborns have a ten-fold risk of dying during the first two years of their lives. 7In many countries in Sub-Saharan Africa, the rate of maternal mortality is rising. The Millennium goal No. 5 of cutting back maternal mortality by 75% in the region by 2015 will never be achieved unless emergency action is taken. 8The direct causes of death of African mothers are hemorrhage, infections, obstructed labor, high blood pressure, or complications resulting from unsafe abortion. Moreover, at least 20% of the diseases suffered by children below 5 years of age can be traced back to mothers in poor health during pregnancy, dietary deficiencies, and insufficient care at birth. 9HIV/Aids is another threat. The transmission of the virus from mother to child in Sub-Saharan Africa, where the infection continues to spread or has stabilized at very high levels, remains a major problem. Indeed, 45% of infected mothers pass the infection to their children. The virus is also becoming one of the major causes of maternal mortality in some African regions. 10And yet a large number of these deaths could be avoided because they are caused by the absence of basic care during pregnancy and delivery. Only 15% of pregnancies and deliveries require emergency care for hard-to-diagnose complications. Access to basic care during pregnancy, delivery and the first month following delivery, would be crucial in saving mothers and newborns. 11AMREF is a key player in mother and child healthcare. It has set up mother and child programs that have become the baseline and been adopted by other organizations and governments throughout Africa. In the course of the next five years we wish to reinforce these programs. Our efforts will continue to be devoted to those in the greatest need: the mothers and their families in the poorer and more remote rural areas or in shantytowns. Reducing maternal mortality by improving access to healthcare and health services. Preventing HIV and malaria during pregnancy and transmission of HIV between mother and child. Raising awareness of hygiene and providing access to safe drinking water. Protecting the rights of women, particularly as regards reproductive health. Train midwives, nurses and community healthcare assistants.Midwives who will also work in prevention, education in reproductive health rights, and help fight mother-to-child transmission (PMTCT) of HIV. 13AMREF has set itself the target of training 15,000 African midwives by 2015. To this end, in 2011 it launched a wide mobilization campaign on the subject, Stand up for African Mothers. Recognizing that women and mothers are at the very heart of African communities, the Stand Up for African Mothers campaign will support the highly symbolic candidacy of African midwife Esther Madudu for the 2015 Nobel Peace Prize (Figure 2). 14Several African countries are covered by AMREF's training programs using varying and appropriate methodologies (18-month course in South Sudan, 3 year program in Ethiopia, e-learning training in Uganda, and in West Africa). This campaign was officially launched in October 2011 on the occasion of the Women’s Forum and will have a press section, a petition, advertising, events, and high points until 2015. 1 doctor for 100,000 people, one of the lowest ratios in the world. 1 child in 4 dies before age 5. The world's highest maternal mortality rate. Healthcare coverage is 25%, mostly funded by NGOs. 15AMREF started to train healthcare assistants in South Sudan during the violent civil war that devastated the country from 1983 to 2005. In 1998, at the Government's request, AMREF set up training for program healthcare assistants in the town of Maridi, where the National Medical Training Institute had just been created. Today, this Institute is still the only source of training for healthcare assistants in South Sudan. After 12 years in activity, it has trained 75% of healthcare operators present in the region (Figure 3A et Figure 3B). The Maridi school graduates are thus the main human resource and the only hope for providing medical care to all populations. AMREF works in close partnership with the South Sudan Ministry of Health to set up a national healthcare development plan, train healthcare professionals, and implement a basic healthcare access program to cover the needs of 150,000 people. With the European Union's support, a program to improve mother and child healthcare is being implemented. These programs target 300,000 direct beneficiaries. AMREF is also carrying out other programs in the region aimed at improving access to drinking water and hygiene to prevent disease and support research into healthcare needs in order to find solutions suited to the country's needs. Figure 3. Community midwives trained by AMREF in South Sudan in Maridi. 16In South Sudan, there is an overwhelming lack of qualified midwives in first-level healthcare centers. In the communities, the situation is extremely serious because women have no access to qualified personnel. About 95% of births take place in villages with midwives who have no training. 17Before AMREF's intervention, there were only 20 qualified midwives for a total population of approximately 10 million. With the support of UNFPA, the Fondation Elle, the Fondation Raja, Gas Bijoux and the donors of the AfriCAN 2010 gala, 34 student midwives were registered for classes at the Maridi National Medical Training Institute in March 2011, where they attended lectures and had hands-on training in the healthcare centers of Maridi and surrounding villages. Once they graduate, these midwives will help 1000 mothers every year. 18The aim is to improve health in South Sudan in the long term, and in particular reduce morbidity and mortality of mothers and young children, as well as disabilities linked to pregnancy and delivery. Train competent community midwives, capable of handling deliveries and providing quality reproductive healthcare in the communities. Train 2,000 midwives in the next 5 years. 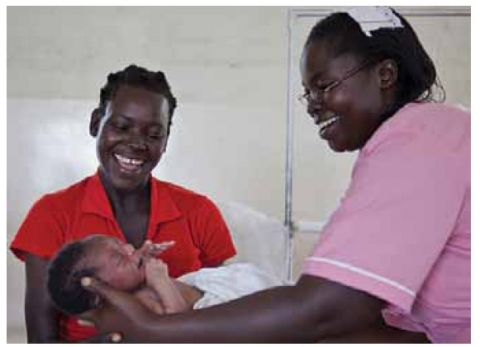 19For every midwife trained, 1,000 mothers benefit from pre- and post-natal care. 20AMREF is currently training 34 midwives in Maridi National Medical Training Institute, and 46 students already graduated in 2010. Candidates from the most remote regions, where there are as yet no midwives, are given priority for the course. 21By government request, AMREF supervises this program. The teachers come from South Sudan, Uganda and Kenya. The students are chosen by the community leaders with AMREF and based on different criteria. AMREF undertakes its own selection process twice a year. When they graduate, the government provides them with work in the health centers of the country or in organizations working there. 22The cost of training for one midwife is 6250 euros, which includes the 18 month global training and registration, accommodations, food, practical exercises in the health centers, uniform, and trip from the community to the Institute of Maridi. 23There are still 1,920 students to finance in order to attain the program targets. 24The training course lasts 18 months and combines lectures with practical exercises. The students learn to handle the most common complications that could arise during delivery, such as a drop in blood pressure, excessive bleeding, and difficult delivery. They also learn to provide pre- and post-natal care to mothers and to recognize the symptoms of more severe complications in order to refer the women to better-equipped medical establishments. Finally, and under close supervision, the students learn to carry out deliveries in order to be ready once they return to their communities. Demonstration of various skills in the lab. 27The first term examination took place in the last week of May 2011. 30In October and part of November, the students had the 2nd clinical rotation which covers: Antenatal care, Health Education, Immunization, and supervised deliveries. In November, the Students had final examinations. The students who passed continued in the second Year of Training. Students who failed fewer than 3 subjects were given the chance to retake the tests. If, on the other hand, a student failed more than 3 subjects, then they were discontinued. 31Peace and stability in the region. 32Mobility must not be limited by safety issues. 33The food insecurity situation must not worsen. 34The project's success requires close cooperation between public bodies (the Ministry of Health in particular), decentralized healthcare structures throughout the country, and renewed financial support from the South Sudan government for health in the region. 36In 2008, Uganda’s parliament passed the Business, Technical, Vocational Education and Training Act No. 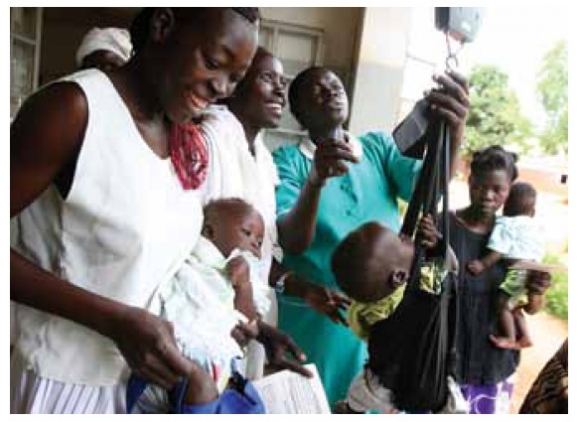 12 of 2008 (BTVET Act, 2008), which restricted the Uganda Nurses and Midwives Council to maintaining professional standards by monitoring, supervising and registering qualified nurses. The Uganda Nurses and Midwives Examinations Board (UNMEB), which falls within the Ministry of Education, was given the full mandate to carry out final national examinations for nurses and midwives and offer certificates and diplomas. 37AMREF was chosen as a project leader to train more midwives to a diploma (registered) level more rapidly in order to help improve the health care of the rural based and disadvantaged populations in Uganda. Significantly, UNMEB requested that AMREF convert this upgrading program into eLearning on the model of the project that the organization is running in Kenya for 22,000 nurses. Design, test and implement a feasible eLearning solution to upgrade Ugandan midwives’ skills (11,000 midwives identified). Build the capacity of the AMREF in the Uganda Country Office, Human Resources Directorates of the Ministries of Education and Health, and Uganda Nursing Council, thereby enabling them to develop, implement and monitor effective eLearning. Use results to influence policy and replicate the program in Uganda and beyond – i.e. create an alternative, reusable model for upgrading health professionals in a resource-constrained environment. 38Using existing modes of training it is not possible to rapidly increase the number of qualified nurses required for the provision of quality health care to the people of Uganda. ELearning will have the dual advantage of rapidly increasing the numbers substantially and also keeping the health workforce at work and home while studying. The products of the program will impact on health delivery and hence facilitate the achievement of the health-related Millennium Development Goals (MDGs) and improve health care for the people of Uganda. 39The organization is actually implementing the eLearning structure around the country, expecting to begin the training of the midwives in 2012. AMREF Flying Doctors was founded in 1957 to help Africa's most isolated communities. For 55 years, AMREF has developed programs focusing on healthcare and developing the skills of African healthcare professionals. AMREF aims to provide sustainable solutions and strengthen public and community healthcare systems. AMREF has an annual budget of 70 million dollars and implements over 145 programs, mainly in east and southern Africa. Nevertheless, since 2007 these training and flying doctor programs have been opening up to several countries in central and western Africa. For over 55 years, AMREF has trained tens of thousands of doctors, nurses, community healthcare agents and midwives. The Flying Doctors have carried out over 90,000 operations in which the technical skills of hundreds of healthcare personnel have been developed and consolidated. Healthcare access for isolated communities via the Flying Doctors. Its expertise and experience have allowed AMREF to develop innovative pilot programs (NTIC1, PHASE2, flying doctors, etc. ), obtaining results acknowledged by all international bodies and that have ensured that the association received several prizes and rewards (such as the Bill and Melinda Gates Foundation award, the Conrad humanitarian prize, the Medical Honors award), as well as obtaining a seat/representation in the main international and African healthcare networks, conferences and organizations3. Considered the first African public healthcare NGO and the first African international humanitarian movement (with 7 million beneficiaries, 10,000 healthcare agents trained every year, 4 teaching centers training students from 35 African countries), AMREF is working to improve the health of African communities sustainably. 3 At the regional level, AMREF is a member of, among others, the technical working group on HIV/AIDS/STDs (sexually-transmitted disease), the East African Community (EAC), the East Africa Network for Monitoring Antiretroviral Treatment (EANMART, RAOCTA in French). It is also a member of the Global Health Workforce Alliance (GHWA), with a seat in the secretariat. AMREF chairs and also hosts the Africa Health Leadership and Management Network. Lastly, it represents the healthcare NGOs in the international partnership against malaria, (Roll Back Malaria).